The vacancy rate for Registered Nurses (RNs) in all responding hospitals was 5.3 %. Acute care hospitals also reported a 5.3 % vacancy rate, and specialty hospitals reported a 6.8 % rate. 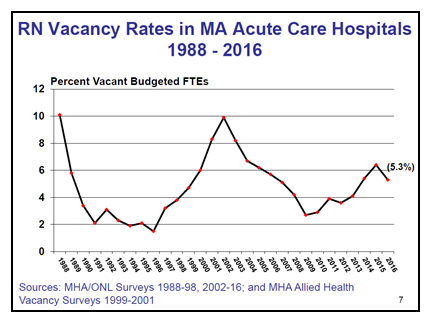 The acute care hospital RN vacancy rate decreased from the 2015 rate of 6.4 %, and now stands 1.2 percentage points above the median rate of 4.1 % for the past 29 years of data collection and this year’s 5.3 % RN vacancy rate is equal to the median rate for that last 15 years of data collection. Vacant positions are covered by per diem nurses, staffing pools, on-call staff, overtime, and agency or traveler nurses.